What is it with “Part 2″‘s right now? They seem to be everywhere. 2013 – the year of the Part 2-er. Mainly, this comment is coming off the back of The Hunger Games: Catching Fire releasing only a few short weeks ago. Back in that review I mentioned the curse of the second in a trilogy, so I’m not going to trip over myself reciting what I’ve already written. Go on – go and have a look, and then come back. Good? Good! Essentially… there’s a lot of pressure on a Part 2. However, the pressure is doubled when one of Part 1’s best characters, Gollum, played by Andy Serkis never appears again in the trilogy. Time to introduce a bloody big dragon voiced by Benedict Cumberbach then right? Yes, The Hobbit: The Desoluation of Smaug, or The Hobbit 2 as we’re going to go ahead and call it to save us typing out that long, long subtitle over and over, picks up where The Hobbit: An Unexpected Journey ended. Thankfully, we don’t need to retread the same turid opening scenes as the first entry though. Further, now that I’m used to the “slightly too fast” 48fps filming, it was much easier to get into than the first entry. This is a solid gold star in The Hobbit 2′s homework book. Essentially, our titular Hobbit, Bilbo (Martin Freeman) must now continue his journey with his band of dwarves so that he can enter through a hidden door in The Lonely Mountain and steal back a jewel for them so that they can restore the glory of the Dwarven Kingdom. Only problem is that a huge fire breathing dragon is sleeping atop it… and he gets disturbed easily. At the outset, this description would make out that The Hobbit 2 is far more action-packed than its predecessor. And indeed, it certainly begins with a damn sight more action than its predecessors “let’s lay the table and have a sing-song” scenes. This time you have giant bears, orcs and spiders. Take THAT last film. But… well… these action sequences just didn’t captivate me in the same way that the original Hobbit’s eventual action scenes with goblins, orcs, trolls and stone giants did. 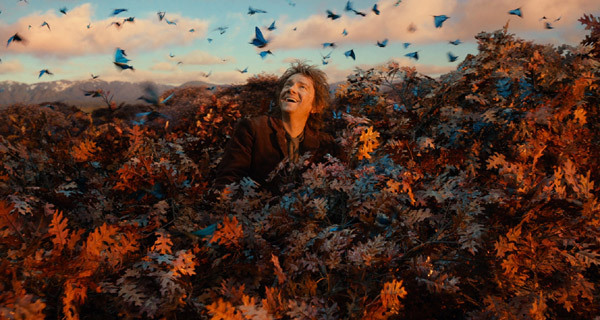 In the original Hobbit these scenes blew me away or made me smile and laugh. Here? Not so much. Spiders? Yeah, we’ve seen those before in the original Lord of the Rings trilogy. They’re not giant golems are they?! Sure, the film’s eventual climax / third features the huge dragon, and there is some orc action, but for me it wasn’t at the same level as before. At least the plot whisks along fairly well and we don’t become stuck in a mire for too long, unlike the first entry. One minute we’re with the elves in the forest, the next we’re in barrels, then a human settlement – it’s all rather brisk. We also get reunited with our favourite archer Orlando Bloom, who takes up a rather central role in the film and becomes involved in a weird love triangle that doesn’t seem to actually go anywhere. Lots of tension, not much affection! Visually, the film is as you would expect: beautiful. 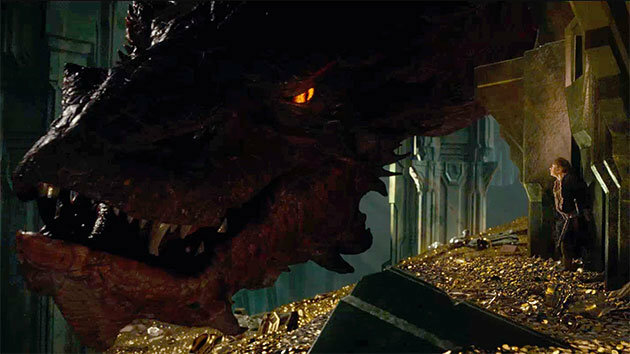 Particularly, Benedict Cumberbach’s Smaug “feels” real enough and is one of the most animated and well-realised dragons that I can remember. You truly feel his personality coming through. Which, for a CGI dragon, is pretty tough to do. Whilst on the subject, it’s probably worth talking about the acting. Arguably, this film belongs to the titular dragon. Martin Freeman is likeable, sure, but he’s not really a “star” here. No, once again, the title of “best character” for a Hobbit film is computer-generated. Cumberbach provides the perfect voice for this character: very English, but at the same time distorted to such a degree that it’s truly menacing and intimidating. Indeed, the FINAL lines of the entire movie are fantastic. But that’s the thing… once again, we have a cliffhanger ending. More of a cliffhanger than The Hobbit: An Unexpected Journey and about on par with The Hunger Games: Catching Fire. Audience members were left bamboozled and disappointed, again. But at least it shows they were engrossed in the story I guess! To me, the film just felt a tad… empty. There were no closing of story arcs (at all) and too many threads were left open. Sure, keep the majority going, but close some, at least? The film just didn’t sate me in the way that I expected it to, which is a shame. But then again, I’m sure next year’s conclusion can pick up where this left off. 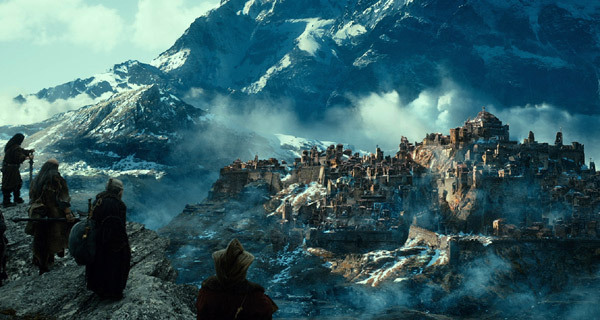 The Hobbit: The Desolation of Smaug is a more immediately accessible watch than Peter Jackson’s first foray into prequel-ville. You’re thrown right into the action, and it never relents. However, I just felt it somewhat lacking. The creatures didn’t impress as much as in the first entry into the trilogy, but at least the 48fps shooting rate wasn’t a distraction this time around. Also, once again, we have a mo-capped character as my favourite. Replacing Gollum was hard… and I’m not saying Smaug totally makes up for this… but at least he’s there to draw the eye and the mind.